I am passionate about seeing a greater release of the Prophetic Arts in the body of Christ, and particularly in the prayer movement. When a worshipful heart is surrendered to the creative expression of the Holy Spirit, powerful things happen! From the day God began creation we see this power at work. Indeed, the first revelation that God gives us about His nature in Genesis 1 is that He is a Creator; He speaks into the void and new things are birthed. As we are created in His image we are also mini-creators, designed to act creatively through the Holy Spirit to bring new things forth. When we create, we participate in His divine nature. In June 2017 PenHOP launched its first Prophetic Arts Exploration day called CREATE 2017. 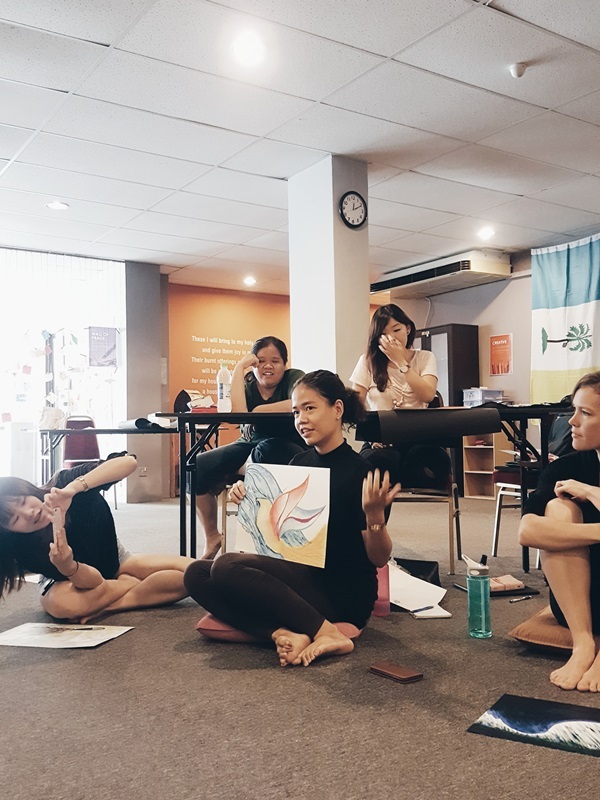 The workshop was designed as a collaborative initiative between PenHOP staff and Christian leaders from Singapore and Selangor, to encourage worshippers to explore new avenues of expression, and to encounter the Holy Spirit’s voice speaking and moving through their art. There were 4 topics covered: prophetic painting, prophetic voice, prophetic song writing, and prophetic dance. Each unique expression illuminated another way that the Holy Spirit can speak. We looked at the blank canvas and asked the Holy Spirit to guide our brush, making two single strokes across the page, and then seeking His message to us personally as we connected these lines (and such incredible messages came forth!). We found greater flow in releasing prophetic messages over one another over through the song of the heart, experimenting with expressing through language. And finally, we surrendered our physical bodies as vessels of intercession, releasing praise and prayer through movements rather than word. I think tears were shed in almost every session by various attendees. Truly, our God is a creative God. His resources are endless, and He delights in speaking to and through His people. The arts provide a unique canvas for listening to the Spirit, because it gets us out of our logical, linear mind, and allows us to listen and sense with a whole other part of ourselves. We stop analyzing and questioning, and begin to let go and let God. It is a freeing and empowering experience, as we realize that we can indeed hear the Lord’s voice, and we can indeed release powerful creativity, even if we have little training or skill. And not only us, but the observer’s heart and spirit can be impacted deeply, softening hard ground and giving new ears to hear the rhema word of the Lord.